The joys of open air motoring usually have a few strings attached like wind noise or rain leaks. Most owners accept these limitations while others strap folding ping-pong tables (I'm guessing) to the thin tubular structure separating scalp from sky. 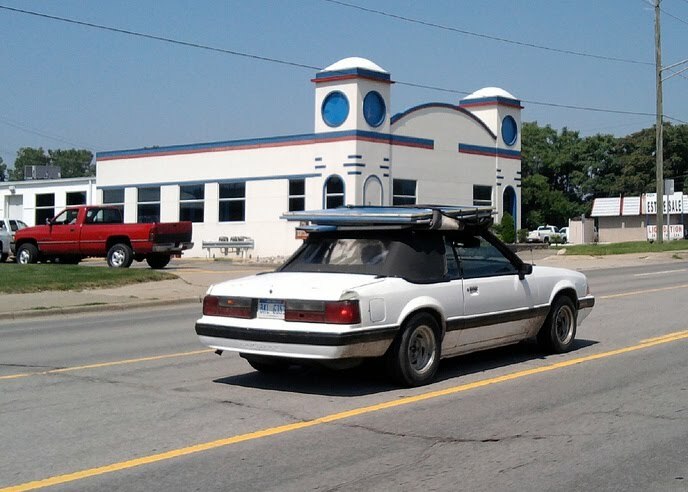 This proud fox body owner has one strap looped over the table and inside the car to allow him to adjust tension with his right hand. Next time buck up for a six pack of PBR for your friend with a pick up truck. Bonus safety tip: While towing your race car in an overloaded Jeep XJ, do not attempt to take pictures with your camera phone.